We herewith, report hereditarily transmitted congenital microcoria in 16 of the 33 members of three generations belonging to Hindu vaishya family. Thirty-three members of three generations belonging to a Hindu vaishya family were examined. 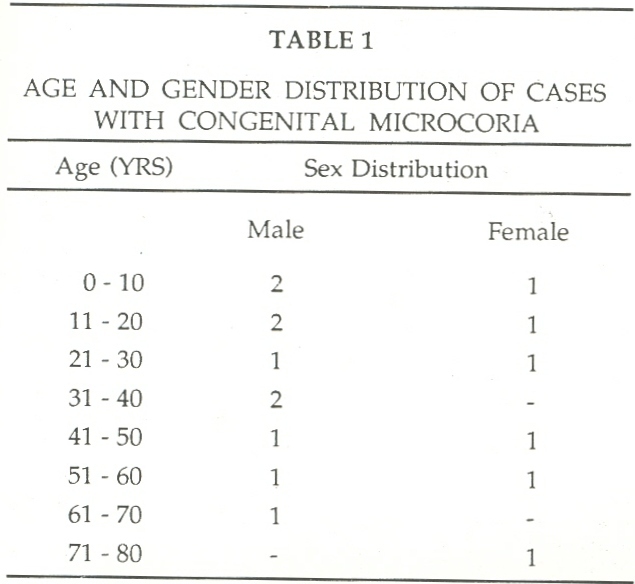 Of these, 16 members (10 men and 6 women) were identified as having congenital microcoria, as per the definition of the disease [Table - 1], [Figure - 1]. The age of the patients ranged from 5 to 75 years. All 16 patients had bilateral involvement. The irides of all the patients were brown and showed poor development of collarettes and crypts. The pupils were less than 2 mm in diameter and there was no reaction to light or accommodation. Mydriatics such as 1% atropine, 1% cyclopentolate hydrochloride, 1 % tropicamide and 10% phenylephrine hydrochloride failed to dilate the pupils. Axial length of 21 eyes of 11 patients was measured. (BioPhysic Medical Paxial Biometer-­Pachymeter, France). Of these 11 patients, 8 were men and 3 were women. Their age ranged from 5 to 65 years with a mean (+ Standard deviation) of 28.09 ( 20.49) years [Table - 2]. One eye with total retinal detachment was excluded from the study. 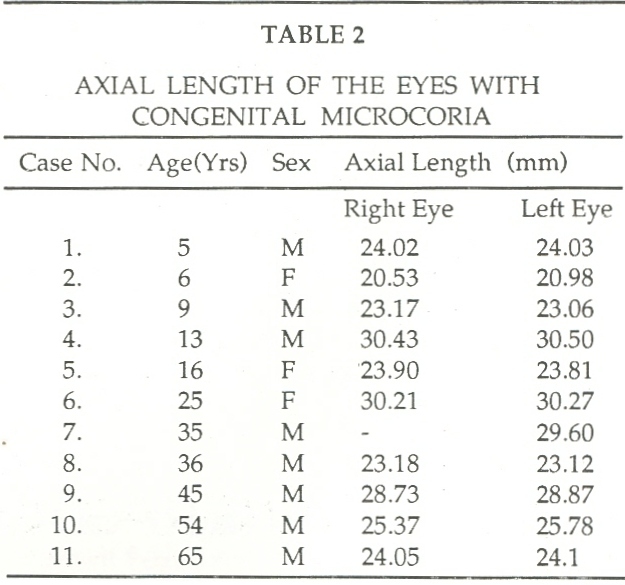 Axial length of the eyes with congenital microcoria ranged from 20.53 to 30.50 mm, with a mean ( S.D.) axial length of 25.60 (+ 3.19)mm [Table - 3]. Coefficient of correlation was calculated to be 0.55. Sporadic occurrence ,,,,, as well as hereditarily transmitted , cases of congenital microcoria have been reported. In our present study, we found 16 patients with congenital microcoria among 33 members of three generations belonging to a Hindu vaishya family, the largest ever family pedigree studied. Though there have been earlier reports of association of myopia with congenital microcoria; , to the best of our knowledge, ocular axial length in congenital microcoria has been measured for the first time. 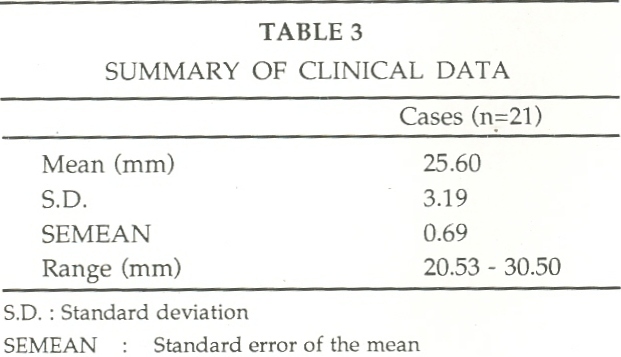 The mean axial length of the eye was found to be increased. The coefficient of correlation showed a positive association between age and axial length of the eye. Coulon G, Do lbosc B, Jeffredo Y, Viennet G, Oppermann A, and Royer J. Congenital microcoria: A case report with histopathological study.) Fr Ophthalmol. 9: 35-39, 1986. Hyams SW and Neumann E. Congenital glaucoma and combined mechanism glaucoma. Am J Ophthalmol. 68: 326-327, 1969. Wilde. Malformations and Congenital diseases of the organ of sight. London. 1862. Tawara A, and Inomata H. Familial cases of Congenital microcoria associated with late onset congenital glaucoma and goniodysgenesis. Jpn J Ophthalmol. 27: 63-72, 1983. Holtman HW. Ein Fall von isolierter beiderseitiger Micro­coria and Linsenektopie. Klin Monatsbl Aegen heild. 166: 98-101. 1975. Simpson WA, and Parsons MA. The ultrastructural pathological features of Congenital Microcoria: A case report. Arch Ophthalmol. 107: 99-102. 1989. Duke-Elder S. System of Ophthalmology. Vol 3 Part II. Congenital deformities. Henry Kimpton. London. pp 590­591, 1964. Butler JM, Raviola G, Miller CD, and Friedman Al Fine structural defects in a case of congenital microcoria. Graefes Arch Clin Exp Ophthalmol. 227: 88-94, 1989. Demidenko, A., Jakobiec, F.A., Hanna, E., Walton, D.S. Ramprasad, V.L., Sripriya, S., Ronnie, G., Nancarrow, D., Saxena, S., Hemamalini, A., Kumar, D., (...), Kumaramanickavel, G.
Bremner, F.D., Houlden, H., Smith, S.E.